Big Fish or Little Fish? – Deciding if you’ll be better suited to being a big fish in a small pond or a small fish in a big pond is an important part of finding a college that will be the best match for you. Majoring in Actuarial Science – When it comes to pay, job satisfaction, and employability, actuaries have one of the best careers available. Net Price Calculators – Get an early estimate of your out-of-pocket cost before you finalize your college list. Acing that Interview – Never turn down the offer of an interview! If you do, it looks as though you are not a serious applicant. Here are some tips to guide your experience. Should Standardized Tests be the Standard? – Although some schools downplay the importance of standardized tests, there is no question that there are colleges that rely heavily on them in making admissions decisions. 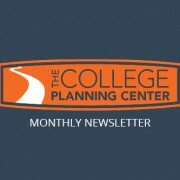 Attached is the College Planning Center’s Newsletter for October 2017. If you know someone that can benefit from this information please pass it along. As always if you have any questions contact me. Choosing the “Right” Application – Here’s a rundown of the most commonly used college applications. Majoring in Psychology – What can you do with a major in psychology and is this the right major for you? It’s Time to Complete Financial Aid Forms – Oct. 1st marks the opening of the FAFSA application for students who will attend college in 2018-19. Who should be completing the FAFSA and the CSS Profile and how do you do these? Show Your Colleges Some Love – More than 3/4 of all US colleges consider “demonstrated interest” in evaluating applicants. How can you show your colleges that you’d really like to attend? I hope you had a terrific summer! Do Rankings Really Matter? – how can you compare colleges with different programs and cultures? Here’s a look at the ways different ranking systems approach finding “the best”. Majoring in Anthropology – students of anthropology develop cultural sensitivity and respect for diversity, both of which are in high demand in our global society. Keeping College Application Costs in Check – applying to numerous colleges gets very expensive. Here are five ways families can keep college application costs under control. Making the Most of Your High School Years – high school should be viewed as a chance to explore your interests. Some ideas to be sure you’re maximizing opportunities during high school. The Early Application Dilemma – students often feel pressured to apply early to avoid falling behind. Is Early Decision or Early Action right for you? Enjoy and best wishes for a wonderful year!